As good as the Pixel 3 is, when Google released the phone last month, it sort of felt incomplete. Part of that feeling is due to Google’s software-first approach to smartphone design which means there’s always code being tinkered with, but the other part was simply because Google still hadn’t delivered two major Pixel 3 features the company teased prior to launch. But now one of those missing additions, Night Sight, is finally rolling out to Pixel 3 owners, and after having the chance to test it out for a few days, I can safely say Google’s sophisticated camera feature was worth the wait. Previously, when faced with certain low-light situations, the Pixel 3 sometimes struggled to best phones with larger aperture lenses like the Galaxy Note 9, or top sophisticated low-light techniques like Huawei’s impressive Night Mode, which really pushed the use of HDR photo processing when it debuted earlier this year on the P20 Pro. However, Night Sight changes all that, and thanks to Google flexing its computational photography skills, the Pixel 3 is now capable of capturing some incredible low-light pics. And to prove it, I took all the best smartphone cameras out for a side-by-side nighttime shootout. One quick note before we get to the pictures. Accessing Night Sight is as easy as scrolling over to the More tab in Google’s camera app and then tapping the icon for Night Sight. But when you actually shoot a picture, it’s not a simple click and you’re done. Similar to Huawei’s Night Mode, Night Sight shoots multiple images during a three to four-second window, and then combines those images together to create a final pic that looks better than each original frame on its own. That means to get the best results, you really need to try to hold your phone as steady as possible. OK, now on to the photos. To set a baseline, I started by taking two shots with the Pixel 3, one with Night Sight off and one with Night Sight on. And while in some respects, I like the pic taken without Night Sight more because its richer colours and darker exposure make for a moodier final image, when it comes to details and sharpness, the photo taken with Night Sight is clearly superior. Text on signs is clearer, the overall image is much less grainy, and you can even make out each individual brick in the building no matter where you’re looking. Next, I moved on to a face-off between the Pixel 3 and the Galaxy Note 9; a battle of computer smarts versus a wider f/1.5 lens aided by a touch of AI tuning. This time at a local bar, while both photos look pretty good zoomed out, you can still see things like the overly yellow colour cast often produced by Samsung cameras in low light. 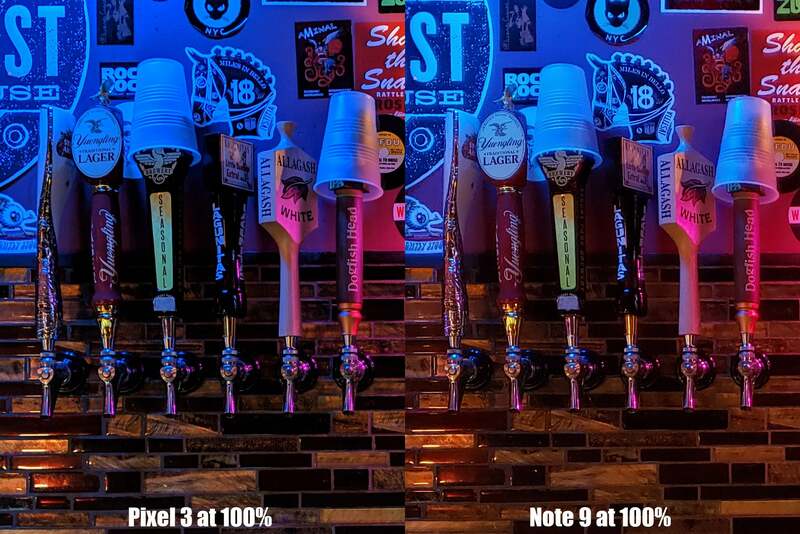 But when you start pixel peeping at 100 per cent, you can really appreciate little details from the general sharpness on every sign and sticker to the Pixel 3's ability to clearly capture the wood grain on the framed chalkboard and the texture on various beer taps. For the Pixel 3's third challenge, I shot a nighttime cityscape with it and Huawei’s new Mate 20 Pro. And once again, while the Pixel 3's pic does show some signs of over-sharpening like the hard pink outline on the lights at the top of the building in the middle, Night Sight still bested Huawei’s Night Mode, which up till now, was the best way to capture challenging low-light scenes. Also, while I was up there, I decided to see if Night Sight could work in combination with Google’s Super Res Zoom feature, and it seems it does. But the bigger shock is that for a camera with a supposed 3x zoom, the Mate 20 Pro’s Night Mode pic was a blurry mess compared to the Pixel 3's image. Now part of this may have been due to having to hand hold both phones, which is far from ideal, but both pics were shot one after another under the exact same circumstances, and I’m still struggling to work out why things turned out so poorly for the Mate 20 Pro. Finally, in what may have been the most difficult challenge, I took a shot using the Pixel 3 and an iPhone XS of a pizza lit almost solely by a single candle. And the difference couldn’t be more apparent. The colours in the Pixel 3's pic are brighter, it features better contrast, and despite a fair amount of noise in the dark background, everything else is just so much clearer. Suffice to say, if you take a lot of pics in dimly lit restaurants, the Pixel 3 and Night Sight is probably your ticket to way better food photography. Night Sight is exactly what the Pixel 3 needed to really round out its photo toolkit. But in a strange way, the biggest winners of all this may be Pixel 1 and Pixel 2 owners, who will also be getting Night Sight over the next few days. Night Sight is now available as an update for the Pixel 3's camera app via the Play Store.